Sustained energy price increases in the United States have preceded declines in economic activity as far back as 1890. This finding applies to two different historical GDP data sets. It suggests a much longer national experience with rising energy prices that began well before the period after World War Two. This problem emerged well before the U.S. transition towards petroleum products when coal was an important energy source. This relationship varies with the state of the economy and appears less evident during some periods, as in the years following the 1929 stock market crash. The U.S. Clean Power Plan (CPP) seeks to reduce CO2 emissions from electric power by 32% from 2005 levels, in part, by adjusting the generation mix. Generating technologies can substitute via two distinct, but interdependent mechanisms: i) utilization - i.e. adjustment of operations of existing capacity and ii) expansion - i.e. decommissioning and construction of capacity. We develop a framework for analyzing these interdependent mechanisms, then construct and validate an empirical model of the U.S. electricity sector using recent data. Assuming current low gas prices persist, increasing utilization of gas (at the expense of higher-emitting coal) will drive higher returns to gas capacity. As a result, under our business-as-usual scenario for 2030 (no CPP) we project approximately 26% less CO2 emissions than 2005 levels, indicating that the CPP target could be met with only limited policy intervention. Current consensus holds that 1) passing through wholesale electricity clearing prices to end-use consumers will produce maximal efficiency gains and 2) simpler forms of time-varying retail rates will capture only a small portion of potential benefits. We show that neither holds in the presence of capacity costs typical in U.S. wholesale markets. Using an optimization model describing the short-term problem faced by an electricity retailer, we find hourly prices that optimally pass through capacity costs. We estimate benefits for a retailer using these prices as well as optimal configurations of a number of time-varying rate structures. Testing a range of realistic assumptions, we find that in the absence of a well-designed demand charge, passing through clearing prices may miss up to three quarters of the benefits possible from optimal hourly prices. By contrast, a simpler critical peak pricing structure enables retailers to achieve approximately two-thirds of the total possible benefits. This paper examines the role of inventories in refiners' gasoline production and develops a structural model of the relationship between crude oil prices and inventories. Using data on inventories and prices of oil futures, I show that convenience yields decrease at a diminishing rate as inventories increase, consistent with the theory of storage. In addition to exhibiting seasonal and procyclical behaviors, I show that the historical convenience yield averages about 18 percent of the oil price from March 1989 to November 2014. Although some have argued that a breakdown of the relationship between crude oil inventories and prices following increased financial investors' participation after 2004 was evidence of a speculative effect, I find that the proposed price-inventory relationship is stable over time. The empirical evidence indicates that crude oil prices remained tied to oil-market fundamentals such as inventories, suggesting that the contribution of financial investors' activities was weak. This paper estimates the daily kWh responses on a working weekday of 1326 single-family-home residents who voluntarily participated in a residential optional dynamic pricing (RODP) pilot in the winter-peaking coastal province of British Columbia (BC) in western Canada. Based on the pilot's operation in November 2007-February 2008, we estimate that the kWh reduction in the peak period of 4-9 pm on a working weekday sans an in-home display (IHD) is: (a) 2.2% to 4.4% at time-of-use tariffs with peak-to-off-peak price ratios of 2.0 to 6.0; and (b) 4.8 to 5.3% at critical peak pricing tariffs with peak-to-off-peak price ratios of 8.0 to 12.0. The IHD approximately doubles these estimated peak kWh reductions. As BC residents already have smart meters with an IHD function, these findings recommend exploring the use of a system-wide RODP program to improve the BC grid's system efficiency. The European electricity market design is based on zonal markets with uniform prices. Hence, no differentiated locational price signals are provided within these zones. If intra-zonal congestion occurs due to missing grid expansion, this market design reveals its inherent incompleteness, and might lead to severe short and long-term distortions. In this paper, we study these distortions with a focus on the impact of restricted grid expansion under zonal markets. Therefore, we use a long-term model of the European electricity system and restrict the allowed expansion of the transmission grid per decade. We find that the combination of an incomplete market design and restricted grid expansion leads to a misallocation of generation capacities and the inability to transport electricity to where it is needed. This results in an energy imbalance in some regions of up to 2-3% and difficulty when reaching envisaged political targets in the power sector. 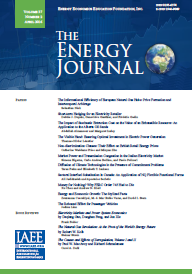 In this paper, a stochastic frontier analysis approach is applied to estimate energy demand functions in the transport sector. This approach allows us to obtain energy efficiency measures at country level that are a robust alternative to the energy intensity indicators commonly used for international comparisons. A transitive multilateral price index is constructed for aggregating the diverse energy components employed in the sector. Due to the likely unobserved heterogeneity among countries, the use of a random parameters model is proposed to accommodate these differences and to obtain different income and price elasticities per country. The estimated model is compared with alternative approaches of addressing this issue such as latent class, true fixed effects or true random effects models. This study is the first to use a random parameters stochastic frontier approach in the estimation of energy demand functions. The proposed procedure is applied to Latin America and the Caribbean, where the transport sector represents a large share of total energy consumption. Using data for the Nord Pool power grid, we derive a space-time Durbin model for electricity spot prices with both temporal and spatial lags. Joint modeling of temporal and spatial adjustment effects is necessarily important when prices and loads are determined in a network grid. By using different spatial weight matrices, statistical tests show significant spatial dependence in the spot price dynamics across areas. In fact, estimation of the model shows that the spatial dependence is as important as the temporal dependence in describing the spot price dynamics. We decompose price impacts into direct and indirect effects and demonstrate how price effects transmit to neighboring markets and decline with distance. A forecasting comparison with a non-spatial model shows that the space-time model improves forecasting performance for 7 and 30 days ahead forecasts. A model with time-varying parameters is estimated for an expanded sample period and it is found that the spatial correlation within the power grid has increased over time. We interpret this to indicate an increasing degree of market integration within the sample period.